At the start of May, the Wellcome Collection organized a festival, On Light, exploring the relationship to light, which naturally included a number of events related to photography and photographic processes. I went along on Saturday 2nd for “Ultraviolet: World Record Cyanotype”, where Melanie King, Constanza Isaza and Andrés Pantoja were aiming to create the world’s largest ever cyanotype print covering approx 110 square meters (actual dimensions 7.5m x 15m). 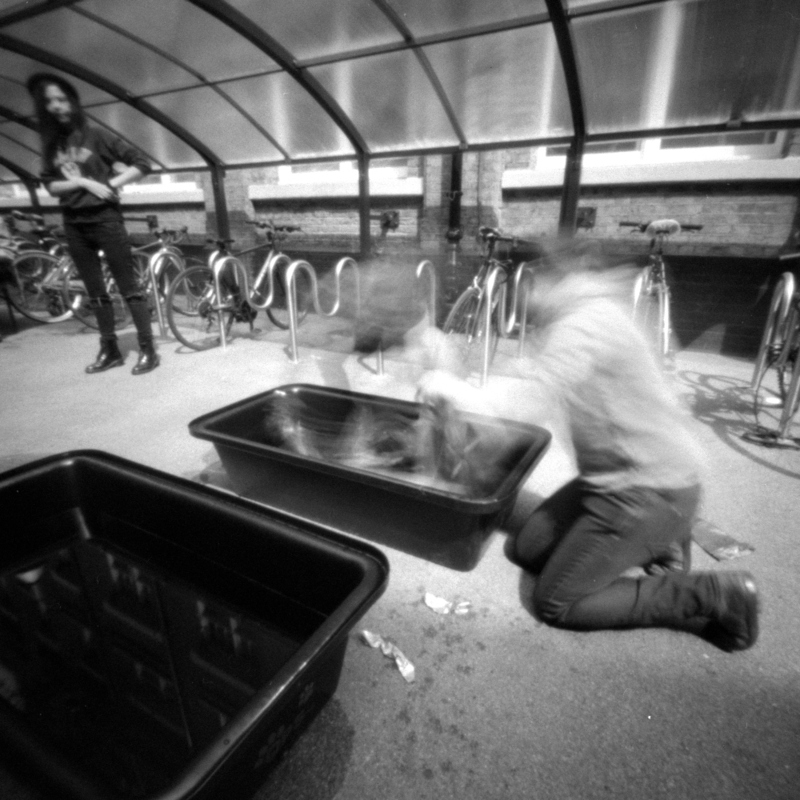 I took along my ZeroImage 2000 camera to document the event, first shooting a roll of Kodak Tri-X 400 black and white 120 roll film and then a roll of Fuji Superia 400 colour 120 roll film. 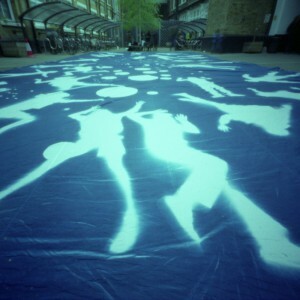 The cyanotype was to be created on fabric, consisting of a number of individual sheets sewn together beforehand to achieve the world record size. 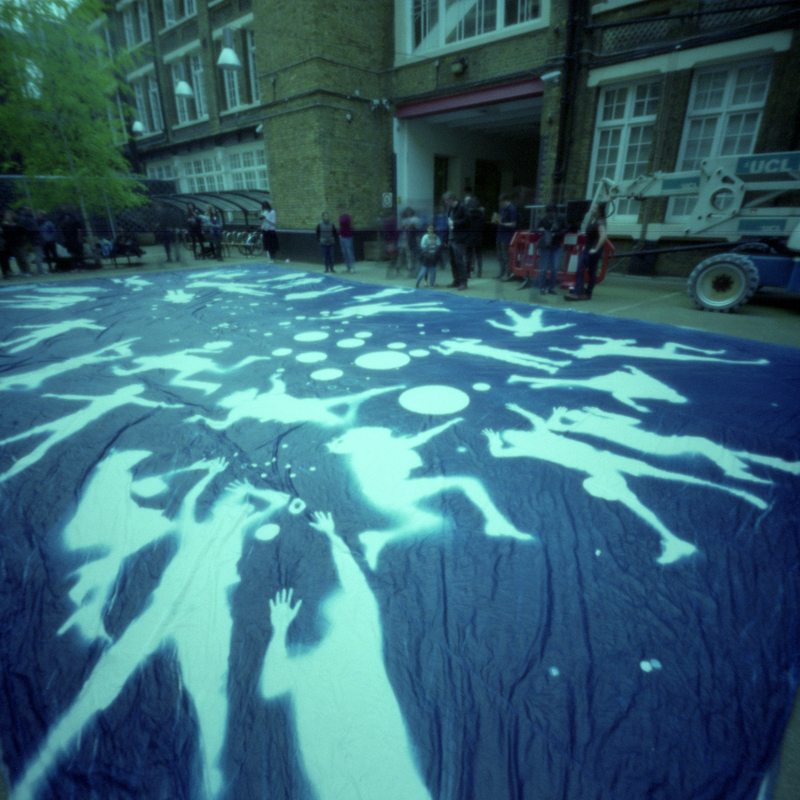 The sensitization of the fabric with cyanotype chemicals was performed the evening/night before in St John on Bethnal Green Church. This of course had to be done at night to avoid premature exposure, considering also the long time needed to dry the fabric properly before it could be packed into a black light proof bag for transport. 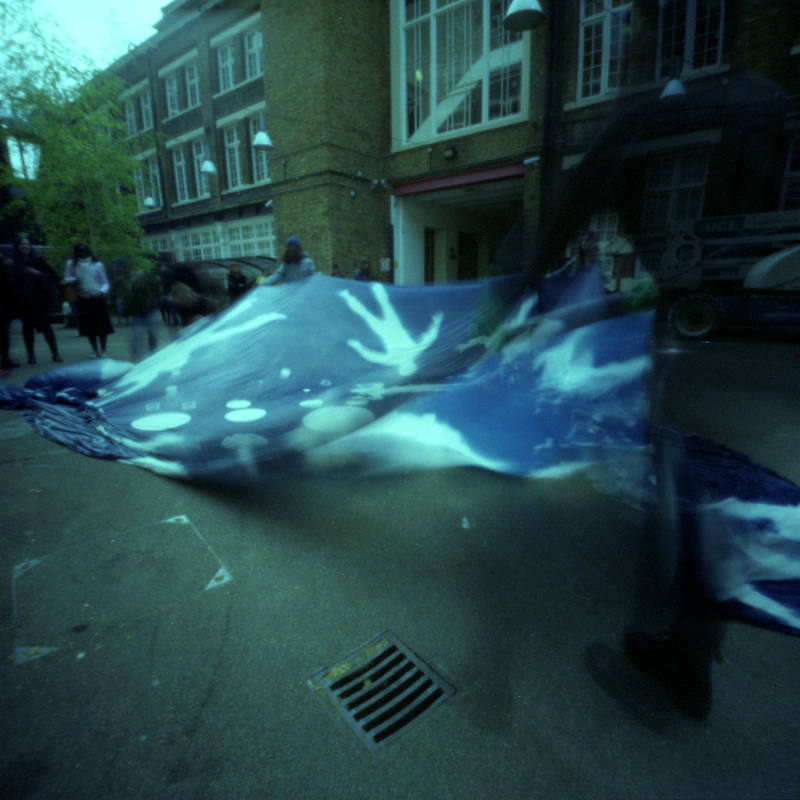 Prior to working with the full sized fabric, a couple of small pieces (estimate about 1.5m x 1m) were used for testing exposure times. Two willing volunteers lay down on the test strips for about 20 minutes, which were then quickly washed. 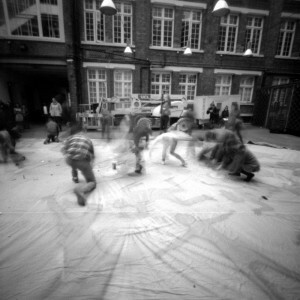 As well as serving as the test exposure, they were interesting demonstrations for the assembled crowd to witness & understand what was going to be done with the full sized fabric. With the successful test out of the way, the organizers moved forwards to assemble a large group of willing volunteers to be the subjects of the full size record attempt. 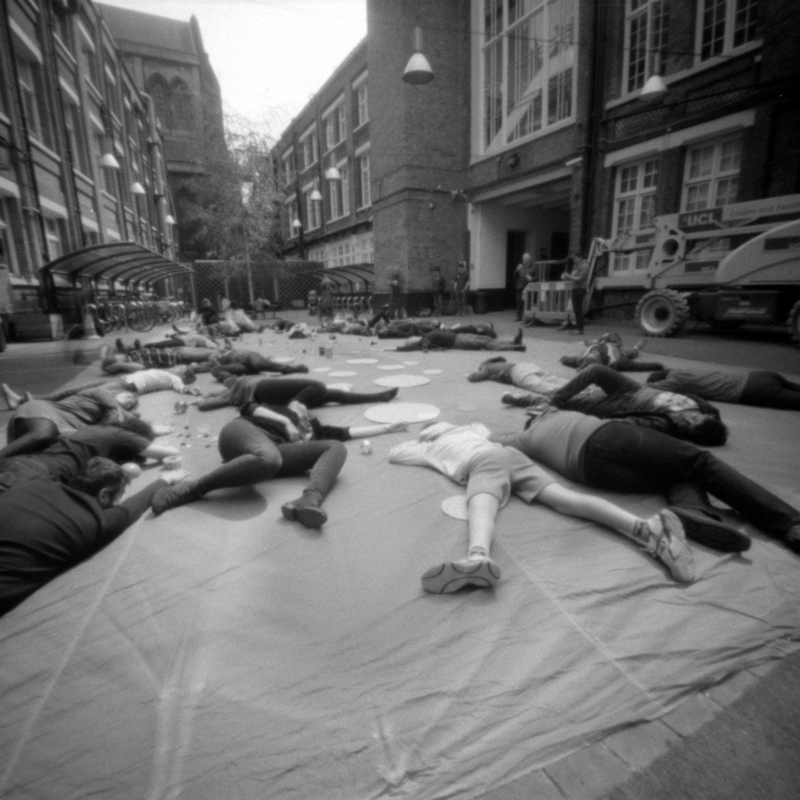 The general idea was for the volunteers to simply lie down on the fabric in a self-determined pose. In addition to that, there was a collection of random objects, predominantly circular, which were to be laid out on the fabric to give some contrasting shapes in the image. 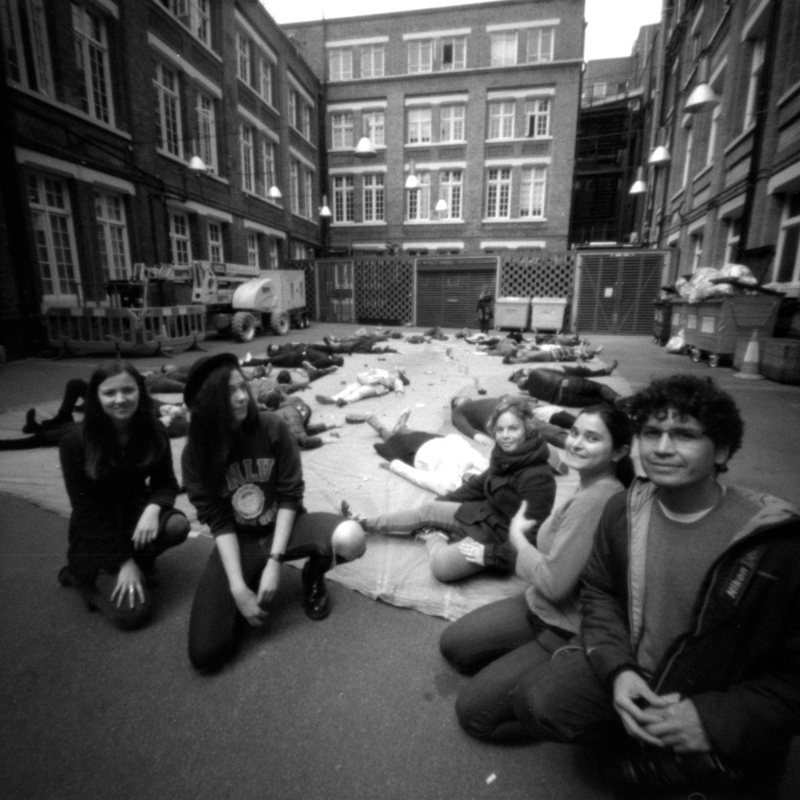 The fabric was swiftly unrolled in a courtyard off Malet Place, the subject & objects took their places and so the exposure had begun. 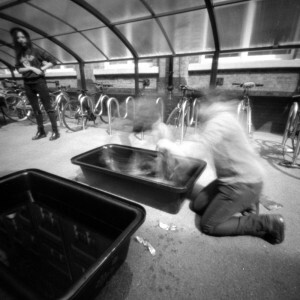 Upon completion of the exposure, the fabric was quickly bundled up and transferred into the large water tubs for washing. This followed the same process as washing the test sheet, except that it took many more changes of the water to fully develop the classic cyanotype blue (& rinse off the chemicals) due to the immense size. After a lot of hard work by the organizers and their team of assistants though, the final result was ready to be revealed. After washing the final developed cyanotype image was revealed to the world. 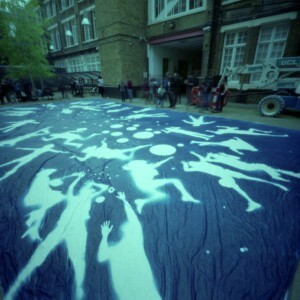 The sheer scale of the finished cyanotype was incredible to behold. The world record attempt was a dramatic success. 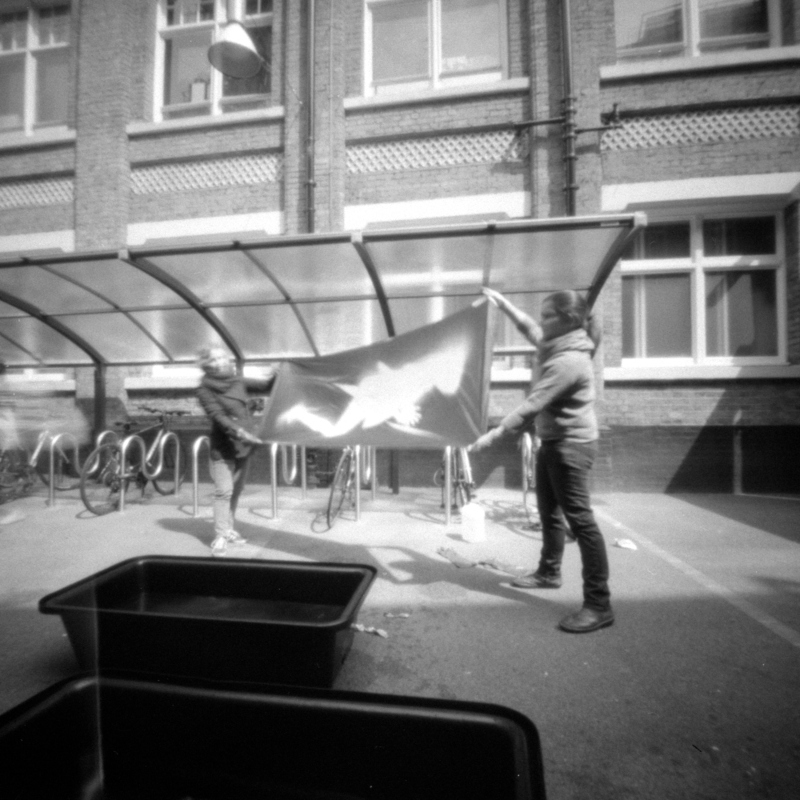 The event was inspirational and left me with an enhanced passion for working with the cyanotype process. To anyone attempting to break this record though – don’t underestimate the amount of work involved in achieving something that on the surface sounds rather simple – nothing is easy at this scale, as the organizers and their assistants will attest. The organizers and some of their assistants. 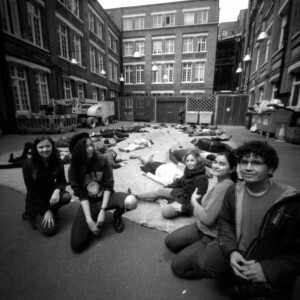 From left to right, Hollie Quinn, Melanie Kathryn King, Francesca Polo, Constanza Isaza Martinez and Tres Peces Navegando. This entry was posted in Events, Photographic Processes, Pinhole and tagged cyanotype, onlight, ultraviolet, world record, zeroimage2000 on May 24, 2015 by admin.